The Rand McNally Map of the Borough of Manhattan the principal portions of the Boroughs of Bronx, Brooklyn and Queens and the Business District of Jersey City. This is a fine 1913 map of New York City by Rand McNally and Company. 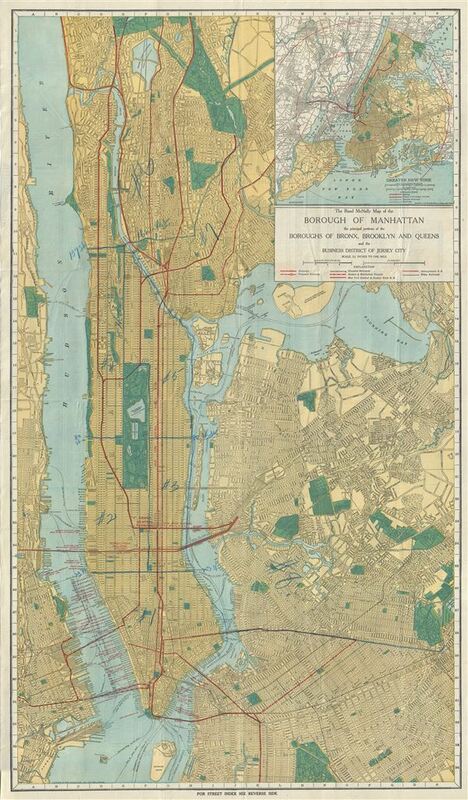 The map covers the entirety of New York City, including the boroughs of Manhattan, Brooklyn, the Bronx, Queens and part of Hoboken and Jersey City, New Jersey. It includes Roosevelt Island, Governor's Island, Ellis Island, Rikers Island (along with 'extension being filled in'), Wards Island and Randall Island. A large inset in the top right quadrant features Greater New York. Fort Washington is identified. The map further identifies various canals, individual streets and avenues, bridges, parks, reservoirs, train lines, ferry lines and important buildings. This map was copyrighted 1913 and published by Rand McNally and Company, New York. Very good. Minor wear along original fold lines. Blue markings at places. Professionally flattened and backed with archival tissue. Accompanied by original binder. OCLC number: 18591342. Stanford University Libraries, G3804 .N4:2 M3 1913 .R33.